Sushi is probably the most popular and well known of Japanese culinary creations. 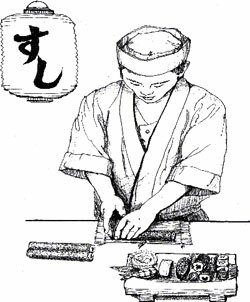 Sushi bars can be credited for introducing the wonderful world of Japanese cuisine to America. Since sushi bars are expensive, more and more people are "rolling-their-own" sushi for healthy and attractive meals to entertain friends or to create delicious party fare. Versatile and ready to eat, Mitoku Toasted Nori is a must for sushi, norimaki (sushi rolls), and rice balls ("onigiri"). Crumbled or cut into strips, it is an attractive garnish for grains, noodles, and soups. On the northeast coast of Japan, in the Sendai region, are the pine covered islands of scenic Matsushima. This pure, cold water coastline is an endless series of quiet coves and sheltered shallows; the perfect place to grow nori. Numerous grades of nori are available in Japan and Sendai Select is considered in the top 1%. Its even texture and translucent sea green color are indications of its superiority. Wasabi puts the bite in sushi. The root of this small green plant is prized for its fiery flavor. Use with caution! A wasabi soup-like dish, Osutsuke is said to clear sinus blockages, headaches, infections and colds. The traditional complement to sushi and sashimi, it is also eaten with somen and other cold noodle dishes. Unlike most commercial products, Mitoku's Wasabi Powder contains no artificial dyes or coloring, and it is the finest available. Fresh wasabi is ground into powder so that it will keep, without having to add any preservatives, such as wasabi sold in "ready" paste form. Sushi Ginger has a refreshing, zesty flavor that combines especially well with rice, tempura and fish dishes. Sliced into thin strips, it's a delicious addition to stir-fries and both tossed and pasta salad. And of course, it is perfect with sushi, as it cleans the palate between different types of fish. No kitchen is complete without a Japanese-style traditional bamboo rice paddle and sushi mat. These high quality 100% genuine Japanese bamboo utensils make it easy for you to start your own sushi-rolling and are a nice alternative to lower quality imitations.